Audiences were not prepared for what Ridley Scott unleashed upon them this summer when Prometheus was projected on screens across the country this summer. Coming nowhere near the tone of his previous Alien film, Prometheus is very heavy on the SCI part of the equation and very light on everything else. Scott goes completely cerebral for a film clearly inspired more by 2001: A Space Odyssey. The question remains, doe s the film play better the second time around? Prometheus begins with a sprawling montage of beautiful vistas and landscapes of a planet that may be Earth, but could also be one of many that the humanoid looking ‘Engineers’ have visited. 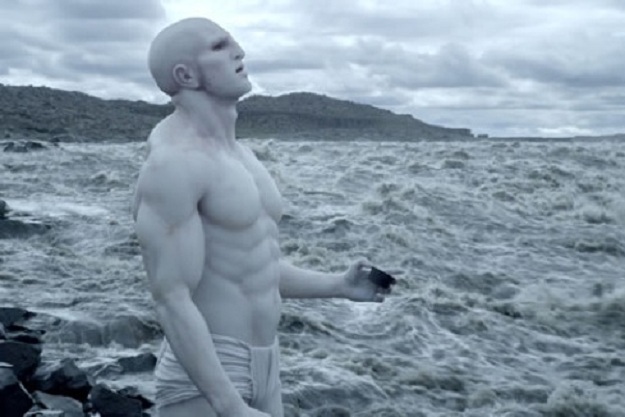 The extremely pale white alien appears near a waterfall and we watch as he ingests a liquid that causes his demise. On the Isle of Sky in the Northern Highlands of Scotland, sometime in the future, we are introduced to doctors Elizabeth Shaw (Rapace) and Charlie Holloway (Marshall-Green) who have made a discovery dating back generations in the caves of the isle. We board the vessel “Prometheus” where we are introduced to the only being awake (the rest of the crew is in cryostasis), the android David (Fassbender). David has spent his time alone awaiting the end of the journey and developing what may be an unnatural fascination with Shaw. Upon their arrival we meet the crew of the Prometheus: Vickers (Theron), the corporate representative, Janek (Elba), the ship’s Captain, Fifield (Harris), a geologist, and Millburn (Spall), another scientist, along with others. The crew are then told by Shaw and Holloway that their benefactor Peter Weyland (Pearce, nearly unrecognizable) has sent them to this remote planet to meet the being they feel all humans were spawned from. Upon investigating a strange ruin on the planet’s surface the crew discovers the remains of some of these beings, while David discovers something else entirely. Prometheus still looks beautiful on Blu-Ray. Rapace shines as the film’s central character, the sequence with an unexpected ‘visitor’ is particularly riveting and brilliant. Fassbender’s David is the perfect mix of naivety with a sinister core that makes his character the most dangerous aboard the ship. The second time around we really can see his machinations more clearly. Theron’s performance works even less the second time around, she’s the least effective of the main characters. Elba’s basically the cigar chomping police chief from every late 80′s early 90′s cop film you can think off, but it works. And you clearly tell he’s having a blast doing it. Pearce is barley in the film and under so much makeup as to make him unrecognizable, yet he still does a good job. The rest of the supporting cast is strong in their roles, leading to one of the strongest cast performances of the year. The intricacies of the script start to shine with a second viewing, and the story plays out more satisfyingly. Having dumped the baggage of the previous Alien films due to more informed expectations we are allowed to enjoy this story in this world more. The visual effects work is unsurprisingly stunning, Ridley has been in this work before and knows exactly what he wants. The brilliant look of the ‘Engineers’ and the ever evolving Alien xenomorph are stunning. 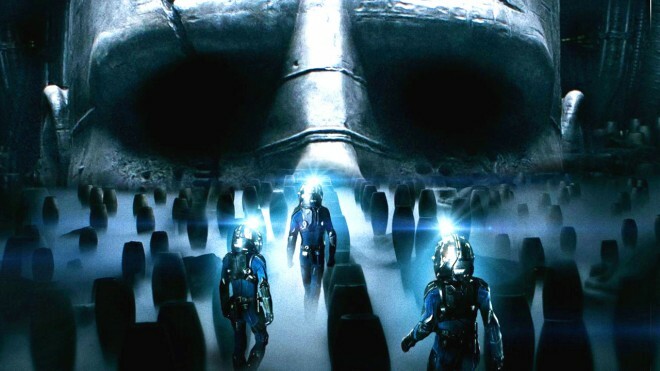 Prometheus’ Blu-Ray comes with a truckload of special features. We get two feature length commentaries, one by Ridley Scott and another with writers Lindelof and Spaihts. A series of character developing mini movie/webisodes under the ‘Peter Weyland Files’ and a half hour worth of deleted and extended scenes including alternate opening and closing sequences. The deleted scenes are excellent and help flesh out the story even more. There is also an entire IPad/IPhone app with second screen to scour even many more hours’ worth of special features like original design art and much more. Ultimately Prometheus works even better with multiple viewings. The sheer volume of special features combined with the gorgeous looking film itself with great performances should make the purchase decision easy for you. 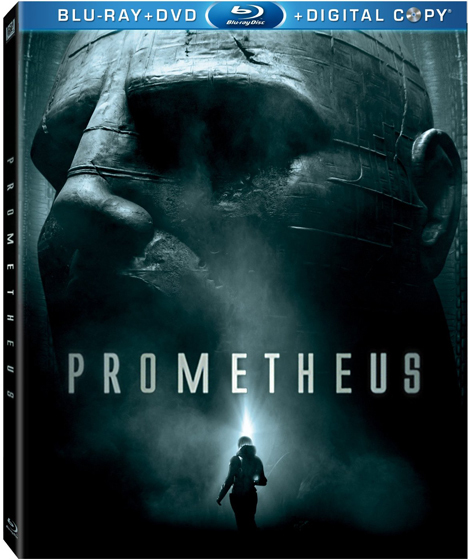 Prometheus on Blu-Ray is a must buy. Much has been made over Ridley Scott’s return to Science Fiction, and more specifically to the universe he launched with 1979’s seminal sci-fi/horror masterpiece, Alien. Just as much hype has been made by Scott himself, downplaying the whole connection to the Alien franchise, and as it turns out, rightfully so. Prometheus is very heavy on the SCI part of the equation and very light on everything else as Scott goes completely cerebral for a film clearly inspired more by 2001: A Space Odyssey than his own Alien. Prometheus begins with a sprawling montage of beautiful vistas and landscapes that we soon discover are not earth, but a foreign planet similar to our own. A very humanoid looking, extremely pale white alien appears near a waterfall and we watch as he ingests a liquid that causes his demise. We then flash back to Earth. On the Isle of Sky in the Northern Highlands of Scotland we are introduced to doctors Elizabeth Shaw (Rapace) and Charlie Holloway (Marshall-Green) who have made a discovery dating back generations in the caves of the isle. 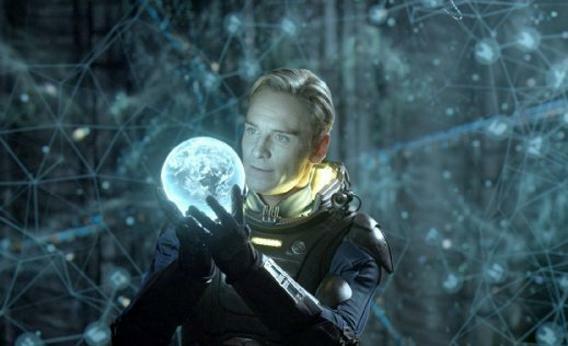 The film then jumps forward many years to the space vessel “Prometheus” and we are introduced to the only being awake (the rest of the crew is in cryostasis), the android David (Fassbender). David has spent his time alone awaiting the end of the journey, over two years, killing time with many pursuits and developing what may be an unnatural fascination with Shaw. Upon their arrival we meet the crew of the Prometheus: Vickers (Theron), the corporate representative, Janek (Elba), the ship’s Captain, Fifield (Harris), a geologist, and Millburn (Spall), another scientist, along with others. The crew are then told by Shaw and Holloway that their benefactor Peter Weyland (Pearce, nearly unrecognizable) has sent them to this remote planet to meet the being they feel all humans were spawned from. Upon investigating a strange ruin on the planet’s surface the crew discovers the remains of some of these beings, and David discovers something else. As the group is forced back to the ship under unforeseen complications, they manage to leave Fifield and Millburn behind and they must stay the night, exploring the ruins in what may not be the best of ideas. And what exactly is David’s agenda aboard the ship? Prometheus looks beautiful. It ranks with Hugo and Avatar as the prime examples of what a talented filmmaker can do to master a medium that other directors are merely toying around with. Rapace shines as the film’s central character, the sequence with an unexpected visitor is particularly riveting and brilliant. Fassbender’s David is the perfect mix of naivety with a sinister core that makes his character the most dangerous aboard the ship. Theron’s performance is adequate, though she’s given little to do here. That said, the scenes she does have don’t always work the best. Elba’s basically the cigar chomping police chief from every late 80’s early 90’s cop film you can think off, but it works. And you clearly tell he’s having a blast doing it. Pearce is barley in the film and under so much makeup as to make him unrecognizable, yet he still does a good job. The rest of the supporting cast is strong in their roles, leading to one of the strongest cast performances of the year. The real question to be answered here is ‘will this fulfill the expectations of the many Alien franchise fans that will cram the multiplexes this weekend?’ And that’s a tough question. 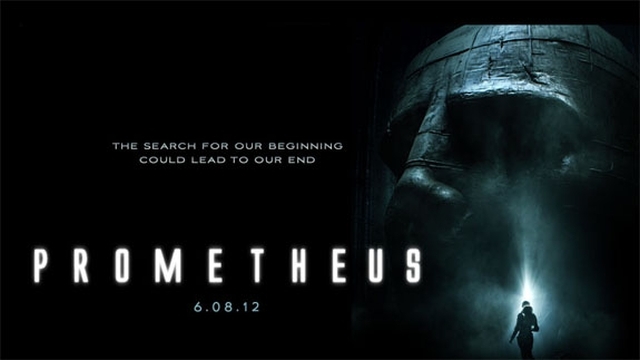 I believe Prometheus is the type of film that will play better with a second viewing. With all the baggage that everyone will inevitably bring into the film, the more cerebral approach will undoubtedly be disappointing for most. But those that can see beyond that and delve into the characters and the story that is presented will most certainly get much more out of the film. It’s the lack of previous baggage going into a second screening that I feel will make it a more successful and enveloping experience. Ultimately, Prometheus is a stunning looking film with many ideas about the evolution of both species and the Alien species. Its visuals and performances alone alone make this a recommend, and I certainly hope I’m right about my hunch when I see it for the second time. Steven Soderbergh’s latest film Haywire is clearly a vehicle for MMA star Gina Carano’s entrance into the world of action films. As far as action stars go, Carano seems to fit the bill. She’s quick, strong, charismatic, and attractive. She can also roundhouse a bad guy in the face with tremendous ferocity, or if the fight goes to the ground, she has a handful of submission moves to make her opponent look like an oversized rag-doll. 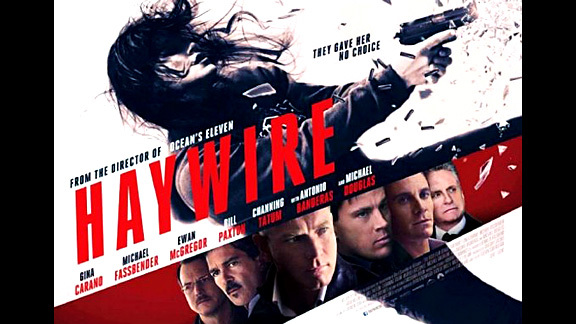 Add to this an all-star cast featuring the likes of Ewan McGregor, Michael Fassbender, Channing Tatum, Michael Douglas, and Antonio Banderas, and you would think that Haywire would be a certain success. Unfortunately this is not the case, as Haywire stumbles out of the gates and never even approaches an entertaining action movie, let alone a coherent narrative. Carano’s debut into the world of features films can be viewed as a success if isolated from the rest of Haywire. Her acting and dialogue delivery may need some work, but her coquettish facial expressions mixed with her volcanic fighting ability make her an interesting action star, not simply a one-dimensional cardboard cut-out. In addition to Carano’s onscreen presence, the fight scenes are often fairly good, especially one with Fassbender in which Carano’s strikes appear to be absolutely bone-crunching. However, these positives are too few and far between given that the script appears to have been written by a dozen monkeys randomly banging away at a keyboard. I may be exaggerating regarding the script, but only slightly. Haywire should have been a no-brainer. A film that audiences could walk into and lose themselves in the action for ninety minutes. Unfortunately, Haywire thinks it’s an intelligent action movie, but it is anything but. Constant location changes (Dublin, Barcelona, USA) and relentless references to off screen characters (Rodrigo, Kenneth, Paul), imply that quantity is equivalent to an intelligent plot, but the complexity turns out to be simply boring and confusing. At no point does Haywire even come close to a coherent narrative. I don’t even feel like getting into the incredibly ineffective Jazz soundtrack or the snail like pace created by Soderbergh. For me, if a film doesn’t even attempt to have an interesting story, then I am not interested in the other details, they are simply incidental. It seems like David Cronenberg had taken a brief hiatus from the film world following A History of Violence and Eastern Promises, two films which are truly unsettling thanks to their depiction of cruel and sometimes indifferent violence in the world of organized crime. Cronenberg returns with A Dangerous Method, a decidedly different story from his past two films, with a focus on the cerebral and the emotional world of psychologists and those afflicted by mental illness. 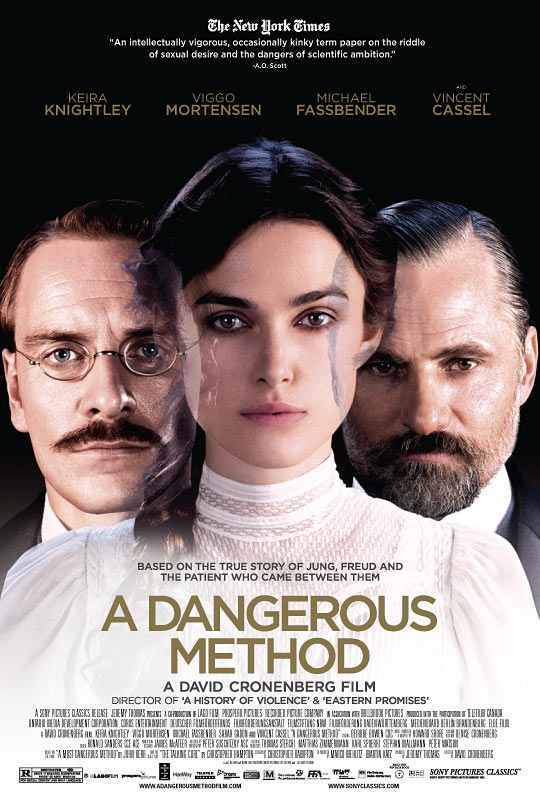 A Dangerous Method is about the relationship between Carl Jung (Michael Fassbender) and Sigmund Freud (Viggo Mortensen), two of the most important figures in the history of modern psychology, and as a result probably one of the most interesting relationships between two individuals in the past hundred years or so. The contrast between their beliefs and character could not be more emphatic. Jung is a young man, open-minded, and has a generally positive outlook regarding the human mind; Freud on the other hand is an older man, certain about the importance of his theories, and satisfied that the underlying cause of neurosis is always sexual in nature. These notable differences make it easier to understand how upon meeting, these men famously had a conversation which lasted thirteen hours. In addition, the relationship between Jung and Sabina Spielrein (Keira Knightley), one of Jung’s patients, also takes centre stage in A Dangerous Method. Spielrein is a fiercely intelligent woman with a debilitating mental illness which Jung finds fascinating. The circumstances surrounding these three characters provide more than enough content for an intriguing story, unfortunately the final product comes off as a little dull and severely hampered by one character/performance in particular. Fassbender and Mortensen do a remarkable job in their portrayals of these intellectual giants. Their onscreen meetings are enthralling and often contain amusing humourous moments. The best scenes in the film are those in which Jung and Freud discuss their unique views and theories which cascade across the dialogue for the enjoyment of audience members with an interest in psychology. Many viewers familiar with Jung and Freud will recognize some of the pairs most storied discussions about dream analysis and one in particular about occult powers. Despite these intriguing scenes, the narrative in A Dangerous Method does not seem properly suited for film. The story often slows to a crawl thanks to the fact that much of the communication between these two men was in the form of written correspondence; be prepared for plenty of letter reading and writing scenes. Finally, any hope of salvaging what was probably a much better book than film is lost thanks to the otherworldly performance by Keira Knightley as, apparently, the single most neurotic person to have ever walked the earth. I wasn’t familiar with the real life character of Sabina Spielrein going into A Dangerous Method, but if she was anything like Kiera Knightley’s portrayal, then this is further reason to tell this story in a book rather than a film. Knightley is onscreen for the majority of the picture, and most of her time is spent screaming, crying, thrashing about, and just looking downright tormented. Dynamics and niceties have been ignored in favour of a frontal assault on the senses. Hints of Spielrein’s intelligence can be found only at the level of the screenplay and are not communicated through Knightley’s acting. She looks to be in the running for over-actor of the year with this excruciatingly abrasive performance that is accompanied by a Russian accent which goes on and off like a strobe light. In the end, she is hugely distracting and manages to topple a film which was already on unstable ground.